Love triangle! Comedic antics!! Gang warfare?! You won’t want to miss out on Shonen Jump's laugh-out-loud feel-good manga series! 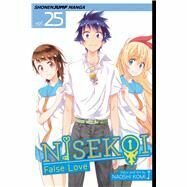 It's hate at first sight when Raku Ichijo first meets Chitoge Kirisaki. But much to their chagrin, the two are forced into a false love relationship to keep the peace between their feuding gangster families.